Do you want to replicate a tested and proven business model to set up your own eco-inclusive enterprise? 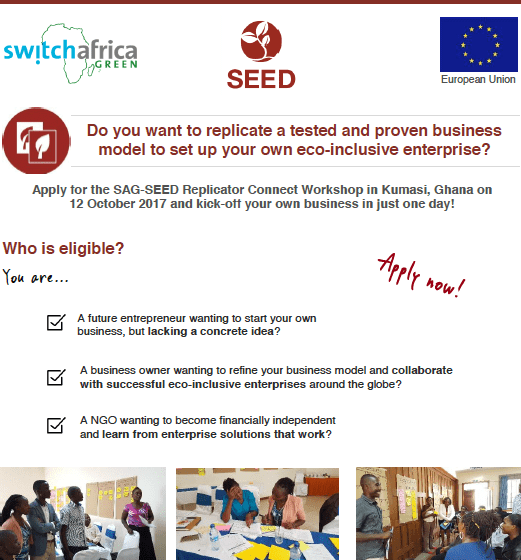 Apply for the SAG-SEED Replicator Connect Workshop in Kumasi, Ghana on 12 October 2017 and kick-off your own business in just one day! The SAG-SEED Replicator brings successful eco-inclusive business models that provide proven solutions to sustainability challenges to various geographic locations. The programme supports the uptake and adaptation of proven business models to different markets in order to multiply positive sustainability impacts. Targeted at different groups of entrepreneurial driven people who are interested in proven and tested eco-inclusive business models, learning from the experiences of others and partnering with successful enterprises, the SAG-SEED Replicator introduces various successful case studies and offers tools and methods on how to anchor proven business models in your individual local context. Get inspired, meet peers and kick-off your business in just one day! Applications must be submitted online via the application form on the website.